Fossils (from Latin fossus, literally "having been dug up") are the mineralized or otherwise preserved remains or traces of animals, plants, and other organisms. The totality of fossils and their placement in fossiliferous (fossil-containing) rock formations and sedimentary layers (strata) is known as the fossil record. Paleontology is the study of the developing history of life on Earth, of ancient plants and animals, based on the fossil record. Fossils usually consist of traces of the remains of the organism itself. However, fossils may also consist of the marks left behind by the organism while it was alive, such as the footprints or feces of a dinosaur or reptile. These types of fossil are called trace fossils. Past life leaves some evidences that cannot be seen, but can be detected in the form of chemical signals; these are known as chemical fossils. For example, characteristic compounds may be found in oils traced to ancient algae and bacteria. An organic compound called oleanane has been considered valuable in providing information about the origin of flowering plants. The fossil record offers evidence in support of the evolutionary theory of descent with modification (the pattern of evolution), but is neutral with respect to the mechanism of that change (the process of evolution). The fossil evidence does support the view that species tend to remain morphologically stable during their time of earth, and that speciation events tend to take place in geologically short periods of time. Fossils also demonstrate that the history of life on Earth is measured in millions and even billions of years, versus the thousands advocated by young-earth creationists. The oldest known structured fossils are most likely stromatolites. Stromatolites are commonly thought to have been formed by the entrapment and cementation of minerals by microorganisms, especially cyanobacteria. The oldest of these formations dates from 3.5 billion years ago. Even older deposits (3.8 billion years old) of heavy carbon that are indicative of yet earlier life are currently proposed as the remains of the earliest known life on Earth. Fossilization is actually a rare occurrence because organic materials tend to decompose. Fossilization requires the relatively quick preservation of bodily remains. Normally, the remains need to be covered by sediment or trapped in resin as soon as possible. However there are exceptions to this, such as if an organism comes to rest in an anoxic (without oxygen) environment at the bottom of a lake. It stands to reason that greater numbers of fossils will be found involving big organisms with hard body parts, species that were widespread, and species that were in existence for a long time. Small, soft bodied organisms living in localized areas and belonging to species that had a short existence are difficult sources of fossils. Geological processes such as erosion and subduction also destroy many fossils. For such reasons, fossils are somewhat rare. There are several different types of fossils and fossilization processes. Permineralization is a fossilization process that involves organic remains being to some degree infiltrated by minerals derived from the surrounding sediments or waters. For permineralization to occur, the organism must become covered by sediment soon after death or soon after the initial decaying process. This may include being covered by volcanic ash, mud, sand, gravel, or other fine-grained sediments. The degree to which the remains are decayed when covered determines the later details of the fossil. The chemicals in the organic material are slowly replaced with hard, rock-like minerals, such as calcite, iron, and silica. Over millions of years, the remains are completely replaced by the minerals, leaving a rock-like copy. Permineralized fossils are among the most durable type of fossil, such as seen in petrified wood. Most dinosaur fossils that are found are permineralized. Some fossils consist only of skeletal remains or teeth; other fossils contain traces of skin, feathers, or even soft tissues. In some cases, the original remains of an organism were completely dissolved or otherwise destroyed after covered by sediments. When all that is left is an organism-shaped hole in the rock, it is called a mold fossil or typolite. If this hole subsequently had been filled with other minerals, it is called a cast fossil and is considered a replacement fossil, since the original materials had been completely replaced by new, unrelated ones. At times, replacement occurred so gradually and at such fine scales that no "hole" in the rock can ever be discerned, and microstructural features are preserved despite the total loss of original material. A compression fossil is a fossil preserved in sedimentary rock that has undergone physical compression. Compression fossils, such as those of fossil ferns, involve chemical reduction of the complex organic molecules composing the organism's tissues. In this case, the fossil consists of original material, albeit in a geochemically altered state. 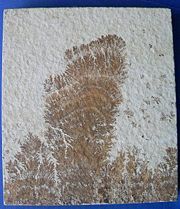 While it is uncommon to find animals preserved as good compression fossils, it is very common to find plants preserved this way. The reason for this is that physical compression of the rock often causes distortion of the fossil. Since leaves are basically flat, the resulting distortion is minimal. Plant stems and other three-dimensional plant structures do not preserve as well under compression. The best fossils of leaves are found preserved in layers of sediment that had been compressed in a direction perpendicular to the plane of the deposited sediment. Typically, only the basic outline and surface features are preserved in compression fossils. Internal anatomy is not preserved. Compression fossils are formed most commonly in environments where fine sediment was deposited, such as in river deltas, lagoons, along rivers, and in ponds. The best rocks in which to find these fossils preserved are clay and shale, although volcanic ash may sometimes preserve plant fossils as well. Smaller animals, such as insects, spiders and small lizards, can be trapped in resin (amber), which is secreted from trees. These fossils can be found in sandstones or mudstones or washed up on beaches, like those around the Baltic Sea. A fossilized dinosaur footprint at Clayton Lake State Park, New Mexico. Trace fossils are those details preserved in rocks that are indirect evidence of life. While we are most familiar with relatively spectacular fossil hard remains, such as shells and bones, trace fossils are often less dramatic, but nonetheless very important. Trace fossils include burrows and other dwelling structures, track marks (such as footprints or evidences of creeping or crawling), coprolites (fossilized feces), eggs and eggshells, nests, rhizoliths or rhizocretions (fossil remains of roots), and other types of impressions. Fossilized droppings, called coprolites, can give insight into the feeding behavior of animals and therefore can be of great importance. The study of trace remains is called ichnology, which is divided into paleoichnology, or the study of trace fossils, and neoichnology, the study of modern trace remains. Another name for trace fossils is ichnofossils, taken from the Greek word "ichnos," meaning "trace." The science of ichnology is quite challenging, as many trace remains cannot be positively assigned to a specific organism, and the study of remains such as burrows can result in older strata being mixed with younger ones. Trace fossils provide us with indirect evidence of life in the past, rather than the preserved remains of the body of the actual animal itself. Unlike most other fossils that are produced only after the death of the organism concerned, trace fossils provide us with a record of the activity of an organism during its lifetime. Organisms performing the functions of their everyday life form trace fossils by walking, crawling, burrowing, boring, or feeding. Tetrapod footprints, worm trails, and the burrows made by clams are all trace fossils. Fossil footprints made by tetrapod vertebrates are difficult to identify to a particular species of animal, but they can provide us with valuable information, such as the speed, weight, and behavior of the organism that made them. Such trace fossils are formed when amphibians, reptiles, mammals, or birds walked across soft, probably wet, mud or sand that later hardened sufficiently to retain the impressions before the next layer of sediment was deposited. Perhaps the most spectacular trace fossils are the huge, three-toed footprints produced by dinosaurs. They give scientists clues how these animals lived. Although the skeletons of dinosaurs can be reconstructed, only their fossilized footprints can determine exactly how they stood and walked. Such tracks can tell us a lot about the gait of the animal that made them, what its stride was, and whether or not the front limbs touched the ground. However, most trace fossils are rather less conspicuous, such as the trails made by worms. Some of these worm castings are the only fossil record we have of these creatures. Organisms that produce trace fossils are usually not preserved with their markings, and although it may be possible to deduce what the animal was doing at the time, it is usually impossible to determine the maker of the trace conclusively and to assign it to a given species of animal. Since different types of organisms are able to make the same types of markings, trace fossils are usually classified by their shape and their cause (such as feeding, dwelling, or crawling), rather than by the types of organisms that made them. Trace fossils are found in abundance in rocks from the upper part of the Ediacaran period, some 550 million years ago, with the earliest occurrences in the Proterozoic (more than 1 billion years ago). One well-known occurrence of trace fossils from this period is the famous "Pipe Rock" of northwest Scotland. The "pipes," which give the rock its name, are closely packed straight tubes, which were presumably made by some kind of worm-like organism. Such traces are known worldwide from sands and sandstones deposited in shallow water environments from the Cambrian period onwards. Chondrites are small branching burrows of the same diameter that superficially resemble the roots of a plant. The most likely candidate for having constructed these burrows is a nematode (roundworm). Cruziana are excavation trace marks made on the seafloor that have a two-lobed structure with a central groove. 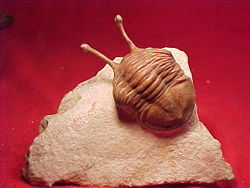 The lobes are covered with scratch marks made by the legs of the excavating organism, usually a trilobite or related arthropod, and in fact several different types of trilobite have been discovered at the end of Cruziana trails. Cruziana are most common in marine sediments formed during the Palaeozoic era, particularly in rocks from the Cambrian and Ordovician periods. Thalassinoides are burrows that occur parallel to the bedding plane of the rock, and are abundant in rocks worldwide from the Jurassic period onwards. They are repeatedly branched, with a slight swelling present at the junctions of the tubes. The burrows are cylindrical and vary from 2 to 5 cm (between 0.8 and 2 inches) in diameter. Thalassinoides sometimes contain scratch marks, droppings, and also the bodily remains of the crustaceans that assumedly made them. Asteriacites is the name given to the five-rayed fossils found in rocks, and they record the resting place of starfish on the sea floor. Asteriacites are found in European and American rocks from the Ordovician period onwards, and are numerous in rocks from the Jurassic period of Germany. Rhizocorallium is a type of burrow, the inclination of which is typically within 10° of the bedding planes of the sediment. These burrows can get very large, over a meter long in sediments that show good preservation, e.g. Jurassic rocks of the eastern United Kingdom), but the width is usually only up to 2 cm, restricted by the size of the organisms producing it. It is thought that they represent marks as the animal (probably a nematode) scoured the sediment for food. The oldest types of tetrapod trace fossils date back to the Upper Devonian period and are found in Scotland, Pennsylvania, and Australia. Important hominid trace fossils are the Laetoli footprints, imprinted in volcanic ash. Pseudofossils are visual patterns in rocks that are produced by naturally occurring geologic processes rather than biologic processes. They can easily be mistaken for real fossils. Some pseudofossils, such as dendrites, are formed by naturally occurring fissures in the rock that get filled up by percolating minerals. Other types of pseudofossils are kidney ore (round shapes in iron ore) and moss agates, which look like moss or plant leaves. Concretions, round or oval-shaped nodules found in some sedimentary strata, were once thought to be dinosaur eggs, and are often mistaken for fossils as well. Living fossil is a term used for any living species that closely resembles a species known from fossils. It is as if the fossil had "come to life." This can be a species known only from fossils until living representatives were discovered, such as the coelacanth and the ginkgo tree, or a single living species with no close relatives, such as the horseshoe crab, that is the sole survivor of a once large and widespread group in the fossil record. Fossils offer evidence that life on the earth is measured in millions and billions of years, rather than thousands as believed by young-earth creationists. Fossils also reveal that there are ancient forms of organisms that no longer exist; in other word, that extinction is a fact. The geologic time scale shows the history of life on earth, as determined by the fossil record. In addition, the fossil record supports the view that events of speciation are normally concentrated in geologically short periods of time, and that species tend to remain morphologically stable throughout most of their existence. Such a fossil record is consistent with the theory of punctuated equilibrium as presented by Stephen Jay Gould and Niles Eldredge. The fossil record also offers evidence of the theory of descent with modification—that organisms descend from common ancestors. For example, Georges Cuvier documented that the lower (older) the rock strata, the more different the fossils were from living organisms. Indeed, fossils found in more recent geological strata tend to very similar to, or indistinguishable from living species, but fossils in older geological strata tend to be markedly different. Fossils also reveal that organisms of increasing complexity have appeared on the earth over time. This is consistent with the view that each stage builds upon preceding stages. Fossil evidence that supports the view of species stability throughout their existence, and sudden appears of new species, is not problematic for the theory of descent with modification, but only with Darwin's concept of gradualism. Some fossils have been considered to be transitional fossils—having characteristics that appear to be between the (assumed) ancestral and descendant forms. For example, Archaeopteryx has been presented as a transitional fossil between reptiles and birds. In 2006, a fossil fish (Tiktaalik roseae) was found in northern Canada that appeared to bridge the gap between fish and tetrapods (four-legged vertebrates), looking like a cross between a fish and a crocodile. However, few transitional fossils have been reported, and many scientists are cautious about these findings. Among other problems, Archaeopteryx, which appears fully formed in the fossil record, is not preceded or followed by fossils showing a gradual transition between reptiles and birds and, according to some theories of bird evolution, appears to have lived after the common ancestor (see Archaeopteryx). In general, the gap between separate fossils is so large that it is difficult to be definitive on ancestral-descendant relationships. One of the problems with fossil evidence for evolution is that there are few gradually sequenced intermediary forms. Fossil lineages from therapsid reptiles to mammals, between supposed land-living ancestors of the whales and their ocean-living descendants, and from an ancestral horse (Eohippus) to the modern horse (Equus) are reasonably well-represented. But, generally, discontinuities or gaps are found in phyletic series rather than a gradual change from ancestral forms to descendant forms. The incompleteness of the fossil record is one explanation given for this, as well as rapid speciation via punctuated equilibrium. What fossil evidence does not support is the view of natural selection as the creative force of evolution (theory of natural selection). Rather, the fossil record is neutral with respect to the mechanism of evolutionary change. Taylor, T. N., and E. L. Taylor. 1993. The Biology and Evolution of Fossil Plants. Englewood Cliffs, NJ: Prentice Hall. This page was last modified on 3 April 2008, at 20:33.